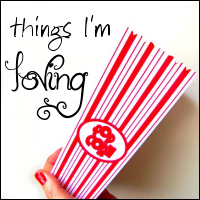 Mind the Minions: Things I'm Loving Number Four! I'm loving the fact that I've had The Man home for the last two weeks! And the fact that he has done most of the housework and cooking during that time. And kept the boys quiet when I've really needed to catch up on some sleep. On thursday he pretended to be asleep until I left the house to go out and spend my birthday money - and then as soon as I had left, he got up and cleaned the house from top to bottom! What a guy!!! So nice when they are around with new babies! Very cool! I loved my husband taking over that job when I had mine...doesnt seem to last for long enough! aww.. he's AWESOME!! Good luck tomorrow, Im sure you'll do great.